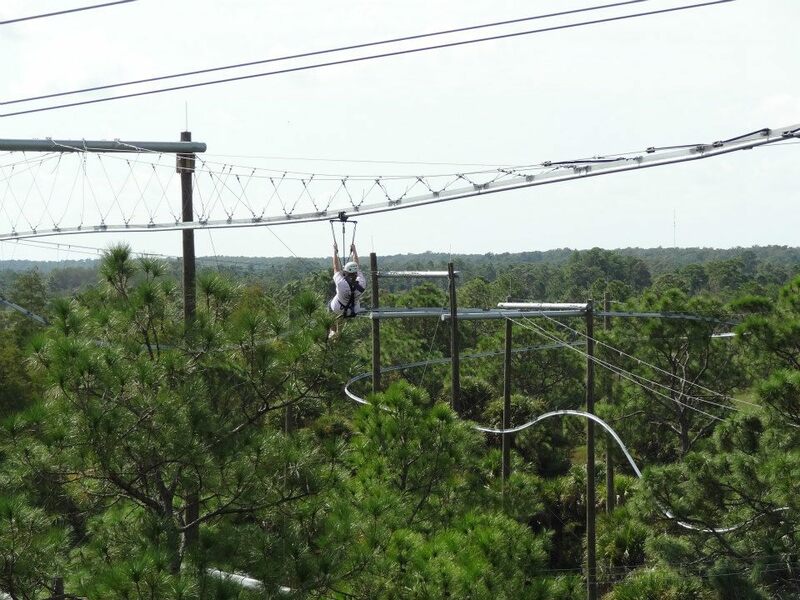 As the world’s largest supplier in patented stationary and mobile ziplines, the folks at Extreme Engineering like to think of ourselves as zipline aficionados, adventure enthusiasts and all around thrill seekers. So when you get the urge to take an exhilarating ride on a zipline at home or abroad, where can you find some of the craziest, most heart-pounding and scream inducing rides? In no particular order, we’re highlighting some of the bucket list worthy zipline creations we’re jumping on to get a colossal adrenaline rush. 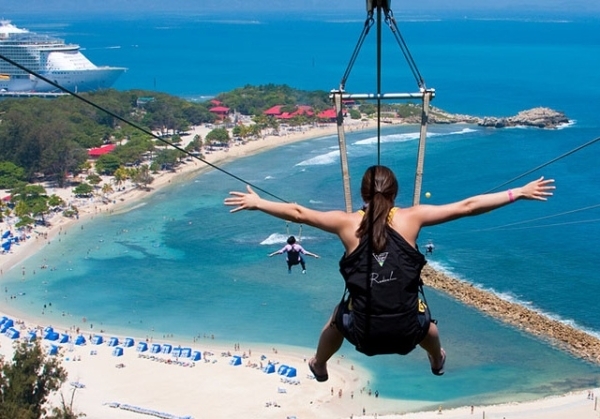 Long live the Dragon’s Breath Flight Line, the longest overwater zipline in the world. Fear of open water? You’ve got a long ride ahead on this 2,600-foot zipline over the sparkling waters of Buccaneers’ Bay at speeds of 40 to 50 mph. Start your adventure in the private beaches of Labadee on Dragon’s Breath Rock and pray for soft white sand on the other side as you glide over crashing waves. Find out more here. 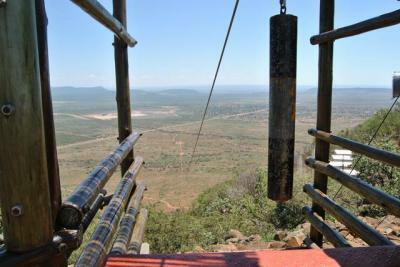 Try to hold it together as you peer down from your perch on an over 900 foot tall isolated hill, anticipating your ride on one of the longest and fastest ziplines in the world. With average speeds of 75 mph and top speeds of a nail biting 115 mph, you’ll soar through the 1.2 mile zipline face down “Superman style” as you try to catch your breath to muster a scream of terror. Find out more here. Zipline + roller coaster = 1,000 feet of unpredictable dips, jumps, sharp turns and thrills off a 65 foot platform on the first and only zipline of its kind in the United States. A new twist on an amusement park favorite, this zipline is guided by gravity but is attached to a rigid rail system instead of a cable. Find out more here. 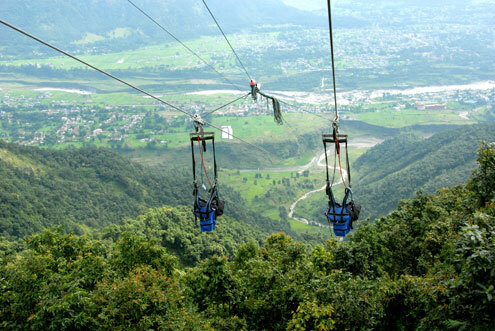 Home to the most extreme zipline in the world, the ZipFlyer in Nepal launches riders 2,000 feet down the side of a mountain over thick forests. Soar at an incline of 56% through the home of Mt. Everest and give a shout out to the snow-capped Himalayas and the Seti River on this 99 mph thrill ride. Find out more here. 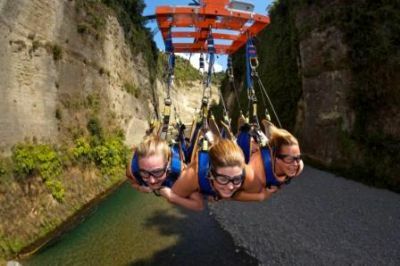 Located at the stunning and picturesque Gravity Canyon in New Zealand, this zipline delivers terrifying thrills with speeds reaching up to 100 mph at a death defying height of almost 600 feet above the river bed. Show some serious fearlessness by riding solo, or grab up to two friends for some moral support as you hurl across this gravity fed zipline face-down through the canyon. Find out more here. Hailed as the longest zipline in the world, the Icy Strait Point ZipRider in Alaska features six separate mile-long ziplines for you to choose from. With a treacherous 1,300-foot vertical drop beneath you, you’ll hear the screams of five other zipline riders as you all simultaneously soar at speeds of up to 65 mph. Find out more here. So which zipline gives you the urge for adventure? Make sure to check out Extreme Engineering’s award winning Mobile and Stationary Fly Wire Ziplines here for your opportunity to provide someone’s next thrill ride.